ST Ericsson already showcased NovaThor L8580 Cortex A9 processor @ 2.8 GHz at CES 2013. The processor features a technology called eQuad, and as I previously noticed there’s no mention of the number of cores at all on the website and many websites reported the processor featured 4 cores. The processor actually features 2 Cortex A9 core, but thanks to FD-SOI technology they are able to do the equivalent of a Quad Core big.LITTLE processor (i.e. 2x Cortex A15 + 2x Cortex A7) electrically. Power Consumption of L8580 @ 1Ghz / 0.65V using FD-SOI vs Similar Platform with Bulk CMOS technology. Since this is just done electrically, you can use the same software as before and will consume much less power, whereas big.LITTLE requires a lot of kernel work. A Cortex A9 will obviously be less powerful than a Cortex A15, but since they are able to boost the frequency up to 3GHz (probably limited to 2.5Ghz in actual product) this can compensate the lower performance, and the die size will be much smaller than on a quad core big.LITTLE processor, since you only need 2 cores for similar power consumption and performance. Charbax uploaded a video with a nice explanation of the system at MWC2013. The first part of the video is very interesting as it explains the technology and its advantage. 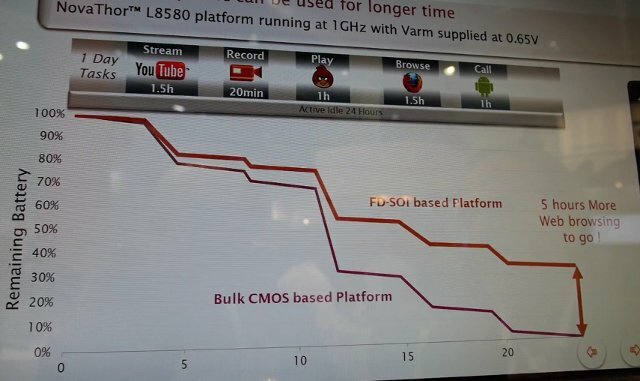 One particularly interesting part is when Charbax asked about big.LITTLE, and ST Ericsson representative explains that big.LITTLE processing is not so interesting now that FD-SOI is available, and it will also end up in cortex A15 processor. He did not say FD-SOI eQuad was a big.LITTLE killer, but it was close :). He may be right about IKS big.LITTLE implementation, but with HMP big.LITTLE, where they can use all cores, big.LITTLE will certainly retain its advantage. What do you think? Update: If you want to know more about eQuad, you can read FD-SOI eQuad White-Paper (15-page PDF), that explains the technology, and also explains that heterogeneous multiprocessing (HMP) is a promising technology, but it’s highly complex both in terms of hardware and software, and it may take a few years to reach its full potential. Funny plot – the main drain is the video decode. But that has little to do with the cpu. “Play” is for playing games I think, so that would be the GPU, and it has nothing to do with the CPU either. But I wonder if the GPU (and other parts of the silicon) can also take advantage of FD-SOI process. HMP little.BIG doesn’t sound like much advantage at all. Quad core mobile SoCs haven’t been a big win in terms of real-world performance. Most mobile use just isn’t that compute bound. Whether or not the two technologies are complimentary doesn’t really speak to whether one might displace the other. Why do so many people seem to forget that cost is an important engineering consideration. big.LITTLE has some obvious costs associated with it in terms of increased die area. I don’t imagine FD-SOI is “free,” but if it provides similar power consumption benefits at lower cost, I could imagine that we might see less of big.LITTLE than we otherwise might. As for whether intel follows suit with big.LITTLE. They’ve already accepted a huge cost in terms of added die area for single function blocks in order to even be competitive in the mobile SoC arena. Why not throw in another x86 core, it would only add maybe 15% to the size of the die, and even less if they ever get a decent GPU on there. I think you (and the Ericsson guy) are right when you say quad core is not bringing that much of an advantage in most applications for now, but once we’ll start to use our mobile device as a desktop platform it will most definitely help. I assume the smartphone desktop concept will really start to take off in 2014.